Sholay: Let’s See If I Can Come Up With Anything New To Say!!! I’ve probably seen Sholay about 15 times by now. Partly because it is just impossible to turn it off once it starts. I think “oh I will just watch the train scene!” And then it is 4 hours later, and I’m all the way at the end. Besides watching it, I’ve read so many books and articles and essays and watched so many films that compare and contrast and discuss with it, I’m honestly not sure if I have anything new to say about it. Or maybe I have so much new to say it can’t be condensed into one post? If you have somehow never heard of the movie before, the best way to understand Sholay, I think, is to start not with how it was made, but how it was received. According to Anupama Chopra’s excellent book, which you should all rush out and buy, at the Bombay premier, the filmmakers and industry leading lights sat in the exclusive seats while the general public filled out the rest of the theater. At the end of the show, instead of the expected cheers and applause, there was silence. After a moment, the audience quietly stood and filed out without a word spoken. No one knew what to make of this, such a thing had never been seen in Indian film before, audiences always made their pleasure or displeasure known. The general consensus was that the film had flopped. The next show had decreased attendance, clearly word of mouth was bad. The filmmakers considered stopping production of prints, maybe re-shooting the ending. In the meantime, the theaters kept playing it. By the middle of the first week, the people started to come. Slowly, the word spread. Every show was sold out. By the second week, the theater owners knew it was a hit. Their concession sales were down because, even during intermission, the audience didn’t dare leave their seats for fear of missing a moment. At one point, during the early weeks, a monsoon flooded the only theater in town showing Sholay. The people arrived for their show, rolled up their trousers and took off their shoes, and waded through knee-deep water to watch a film they had already seen five, six, a dozen times. By the third week, watching Sholay was accompanied by a hum as the entire audience joined in and recited the dialogues, sang the songs, even imitated the sound-effects in time with the film. That first audience had been in shock, unable to deal with what they had experienced. It wasn’t until days later that they began to speak of it, to share their emotions with their family and friends, and slowly the word spread that Sholay was a once in a lifetime experience. People came, and came back, and came back again. The film played non-stop for 5 years. Over the years, Sholay became a part of people’s lives. I had a friend whose parents’ Wedding anniversary was referred to as “the year Sholay came out”, the same why you would say “The same year as Indian Independence”. The Sholay style writing, the iconic 3D and fire-rimmed title on the poster, became as common as Times New Roman, found on taxi cabs and storefronts. I first started getting an idea of this in 2010, when Mac Mohan died and I was confused because all the headlines said “Sambha dies”. 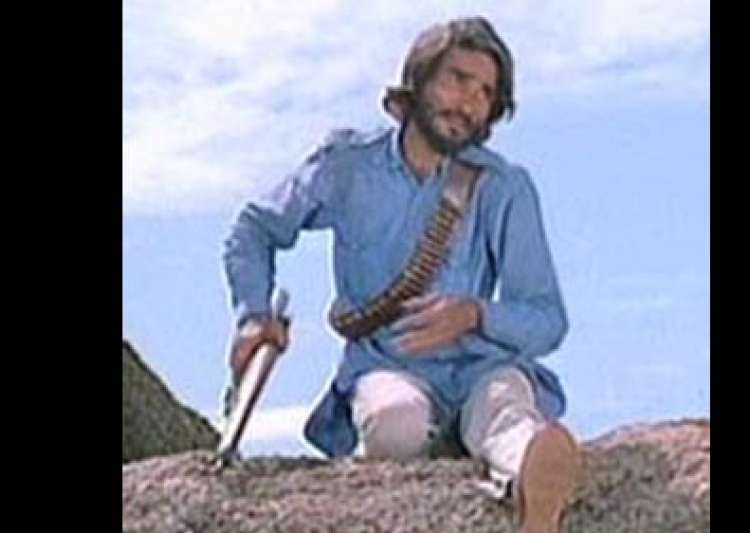 Didn’t Sambha die in 1975? Didn’t Jai and Veeru shoot him off his horse? But by 2012 when Ak Hangal died, I was used to it and ready for all the obits to be headed “Itna sunnata kyun hai bhai?” And “Rahim Chacha dies”! Although I guess in this case it really was the first time Rahim Chacha died, right? He was still alive at the end of the film, right? But for both actors, their entire marriage, children, career, even their own name, are less important in summing up their life than those few months they spent working on Sholay. More than just being the most important part of the actor’s lives, Sholay became a part of the fabric of India. The characters of Jai and Veeru, Basanti, Thakur Sahib, Radha, and Gabbar have become familiar archetypes along with Ram and Sita, Radha and Krishna. The dialogue is quoted along with Nehru’s speeches and Ghalib’s poetry. According, again, to Chopra’s book, the magic of Sholay started during the making of it. Over the months, as filming continued, it changed the lives of all involved. Sholay was made by Ramesh Sippy, son of producer G.P. Sippy, before he was 30. It starred Amitabh at the beginning of his stardom, his new wife Jaya Bachchan at the height of her stardom, Hema Malini, India’s Dream Girl, shortly after her debut, and action hero Dharmendra, star for over a decade with a reliable and resilient fan base. The leader of their band was played by Sanjeev Kumar, the actors’ actor, while the villain was stage actor Amjad Khan, in his first film role ever. The writers were the young team Salim-Javed, just beginning their creative dominance of the industry, Salim was approaching 40 while Javed was not yet out of his twenties. The tone of the production was the confidence of youth supported by the authority of age. Behind the scenes, G.P. had promised his director son whatever he wanted to create his vision of the “perfect” film. They brought in stunt directors from London, built a whole village from scratch, used Dolby sound for the first time in Indian film. The only compromise G.P. insisted on was the use of standard as well as widescreen ratios. Ramesh was determined to make his vision in widescreen, but bowed to his father’s wisdom that the majority of the theaters in India would be unable to project it. So every scene was shot by two cameras, one with the top and bottom of the lens blacked out to simulate a widescreen ratio, the other standard. These two cameras, G.P.’s pragmatic profit seeking vision and Ramesh’s artistic futuristic dream, both captured the same images. Sholay was both a grand ambitious vision of India in the future, and at the same time a populist action movie that could be enjoyed in the now. As filming began, slowly, the characters began to overtake the actors. 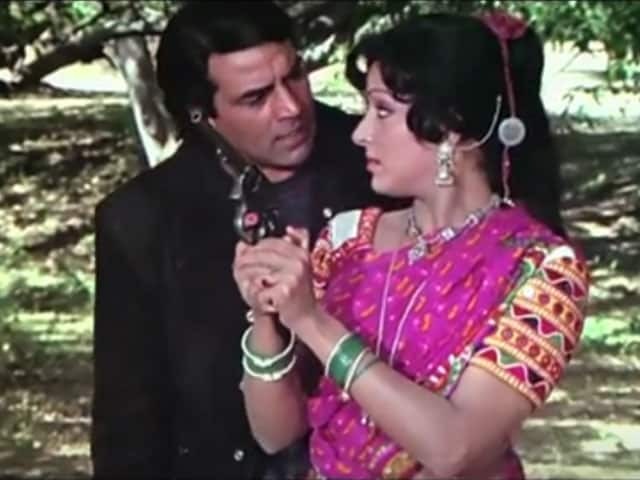 In the same sequence in which Dharmendra’s character “Veeru” tricks Hema’s “Basanti” in order to put his arms around her, Dharmendra himself was falling in love with his co-star, and tricking Hema by paying off the cameraman to make errors and force multiple re-shoots. As Amitabh’s character Jai stares at Jaya’s Radha with increasing love and care, Amitabh himself was watching his new bride glow as she carried his first child. As Sanjeev Kumar’s Thakur Sahib slowly falls apart as he watches his dreams die, Sanjeev Kumar’s heart was breaking as he watched the woman he loved, Hema Malini, falling in love with another man. Meanwhile, Amjad Khan, playing the villainous outcaste Gabbar Singh, hated by all, was feeling increasingly isolated on set as he realized none of his co-stars had confidence in his ability to pull off this difficult role in this, his first film. Somehow, the filming managed to capture a brief bubble of time in which the life of the character and the life of the actors over-lapped and, slowly, merged. This was true even in the early stages. The script-writing team of Salim-Javed was made up of Salim Khan and Javed Akhtar, best friends and partners, who wrote the greatest onscreen relationship of Indian film between Amitabh Bachchan’s Jai and Dharmendra’s Veeru, best friends and partners. They choose to show not the early years of their friendship, that is taken as a given, but rather the end. Even before the tragic climax of the film, Jai and Veeru are already pulling apart as Veeru becomes closer to Basanti, a woman Jai does not appreciate. Salim Khan wrote a scene in the film in which Jai goes and speaks to Basanti’s family, managing to passive aggressively insult Veeru in an attempt to sabotage the romance. This scene was based on Salim’s own attempts to break Javed’s growing relationship with the actress Honey Irani. Eventually, Javed did marry Honey, and while the partnership managed to whether that storm, other factors (Salim’s own second marriage, Javed’s growing alcoholism, the slowly growing gap in their artistic styles) managed to break the relationship. The theme song of Sholay is “Yeh Dosti” (This Friendship). It promises that, come what may, this friendship will never break. Salim and Javed’s friendship did break and then, years later, was restored by the film they made to honor it. When the director Ram Gopal Verma attempted to remake Sholay (a common practice in India, where copyright laws are loose), they came together again to fight him in court to protect their creation, and as a result, rediscovered the friendship that inspired it. The greatest change Sholay wrought was on the young filmmakers and future filmmakers who watched it. Every film since has included some moment of homage, of influence shown, of respect given, to Sholay. It has become the single factor that ties together every citizen of India, every film of India, every element of Indian culture, into one unified whole. Watch Sholay, and you will understand Indian film, India, the people of India, the people everywhere, all of humanity. Chennai Express: when arriving in the village immediately prior to the final confrontation, the background music drops away and only the sounds of the village are present, including the distinctive sound of a blacksmith hammering a sickle and a traditional working of cotton using a stringed carder making a plucking sound. The same effect is used prior to the first arrival of the bandits in Sholay. Dil Bole Hadippa: At the end of the “Discowale Kisko” song, there is a brief shot showing the aftermath from the top of a ferris wheel, imitating a similar shot following the Holi fight scene in Sholay. Once Upon a Time in Mumbai: During the “Pee Loon” song, the character played by Emraan Hashmi wears the same all denim outfit that is Jai’s uniform throughout Sholay. Main Hoon Na: In the flashback sequence, the sound of a creaking swing is used to evoke sadness. Kuch Kuch Hota Hai: The comic character played by Jonny Lever references his father, an “Anglaise ki Tailor”, a pun on the comic character in Sholay who repeatedly refers to himself as an “Anglaise ki Jailor”. Dilwale Dulhania Le Jayenge: Has the same ending, a train pulling away from a village station with the hero and heroine inside. Student of the Year: the music of “Yeh Dosti” plays as the two best friend main characters reunite. Baazigar: the heroine, played by Kajol, is introduced with a spoof of the introduction of Gabbar Singh’s character. Assorted other minor ways the film is alluded to in innumerable other films: pronouncing suicide as “sooeecide”; playing a harmonica; striped prison uniforms with shorts; characters riding in a motorcycle with side-car; flipping a coin; appearing to fall before a villain when actually throwing dust in their eyes; ferris wheels; merry-go-rounds; any time a woman is forced to “dance for her love”; shooting off handcuffs; prisoners traveling in a freight car; a lengthy stand-off at a wooden bridge (often including a shot looking up from beneath the bridge); the names Basanti, Thakur, Veeru, Jai, Dhano (for a horse or vehicle), Ramlaal, Gabbar, Sambha, Bhopali, and Kaalia. This entry was posted in Uncategorized and tagged Uncategorized by mredlich21. Bookmark the permalink. Wow… awesome article. Growing up in the south of India, The only Hindi movie i remember being taken for was Sholay. I probably was too young, since i don’t remember watching the movie itself, and i was anyway born many years after 1975 (so i was probably taken to a rerun, which was more common back then). My most solid memories are of fighting with my sister saying that Dharmendra is stronger than Amitabh, and since then I would say “Dharmendra is my favourite Hindi actor” & She would say Amitabh. Did not notice any of the Sholay references you cited when i watched some of those movies, probably need to watch Sholay and all these movies again. Thank you! Margaret, your summary about how Sholay was received, reminds me of very successful movies in Telugu too. There are three movies that I can mention – Shiva (by Ram Gopal Varma), Shankarabharam (you must see it) and Bahubali. The audience silently left the hall and critics couldn’t understand what to make out of it. In retrospect we can conclude that the audience were spellbound and it is even difficult for them to say ‘this movie is good’. BTW, Sholay moments include the watertank scene. It is copied IRL and in sevaral movie parodies too. In the eighties before the age of cable and internet the only time that new or good films, whether Egyptian or foreign were shown was in Eid, I grew up watching Sholayonce a year on TV. Thank you! I love getting these kinds of personal stories. do you still get responses on the Sholay article? Unfortunately not. My articles on the older classic films tend to get the fewest views and comments. Recently saw Mere Gaon Mere Sesh, which is inspiration to Sholay. Villans,village setup, hero are very identical.